Antenna Knowledge - Aijia Communication Co., Ltd.
A transmitter generates a radio frequency (RF) signal, and then sends the signal through a transmission line to an antenna. The antenna broadcasts the signal in the form of electromagnetic (EM) wave into the space. When the EM wave is received by another antenna at the designated location, a transmission line passes the signal from the antenna to the receiver, and the communication path is completed. In a word, antenna acts as a main role in wireless communication network. No antenna, no wireless communication. There are many types of antennas that can be classified into different categories under different circumstances. Antenna is a set of conducting wires that allow electric current to pass. When the electric current fluctuates, the lectromagnetic wave radiation occurs. The antenna radiates the wave energy into space or receive energy from the space. Dipole antenna is one of the most fundamental antenna that still be widely used today. A single half-wave dipole can work independently, or work as a parabolic antenna's feeder. Several half-wave dipoles can combine to become antenna array. A dipole antenna with two arms of same length is named symmetrical dipole. If each arm is equal to 1/4 of the wave length and total length is 1/2 of the wave length, such dipole is called half-wave symmetrical dipole (Figure 2a). 1. radiates the energy into space from the transmission line. 2.radiates most of the energy to the desired direction. 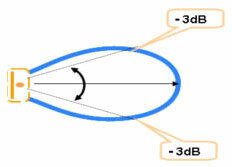 A vertical placed half-wave dipole antenna has a "donut" shape 3-D radiation pattern (Figure 3.1a). From the vertical plane (Figure 3.1b), the maximum radiation is pointing at the horizontal direction. From the horizontal plane (Figure 3.1c), the radiation is equal to all directions. Several symmetrical dipole antennas can form an antenna array to control the radiation direction. The "flat donut" radiation pattern suggests the energy is further converged on the horizontal direction. A reflection panel also works for biasing the radiation to one side. The following graph shows how the reflector works. By placing the reflector beside the antenna feeder, the radiating power are reflected to one side C thus increases the gain. The parabolic shape reflector works like a torch which converges the energy to one point, so that the gain dramatically increases at the pointing direction. Under the same input power, gain is the ratio between the highest antenna's radiated power intensity and the standard unit antenna. Antenna gain represents the convergence of the radiation energy at the pointing direction. If Gain G=13dB=20 , to radiate 100W with the antenna, it only needs 100W / 20 = 5W input power. A half wave length dipole = 2.15dBi. In the radiation pattern, in most cases there are more than one lobes, which is called the mainlobe with the highest radiated energy and the rest is called sidelobes. Beamwidth means degree of the gain decrease by 3dB from the maximum gain, or, when the power intensity decreases to its half. In the radiation pattern, the power ratio of the mainlobes front and back is called Front to Back Ratio (F/B Ratio). The higher the F/B Ratio value, the more energy is not wasted in the unwanted direction. Antenna radiates energy in electromagnetic wave form. The electromagnetic wave is formed by two perpendicular fields C the electric field and magnetic field. It is defined that the polarization direction is identical to the electric field, or E field. Normally we use vertical polarized antennas, but sometimes we apply horizontal polarized antennas for communications. With over 25 years in specializing in design and manufacture antennas, AIJIA antennas are well known all over the world. Panel antennas are normally installed in base stations. Panel antenna has certain degrees: 60, 90, 120 etc. Usually several antennas group together to form an antenna arrays in order to cover the whole area in 360 degrees. Parabolic antennas are mostly used for distant communications. The dish shape reflectors highly converges the radiation energy into the pointing direction thus its gain are very high (usually 20 C 30dBi). 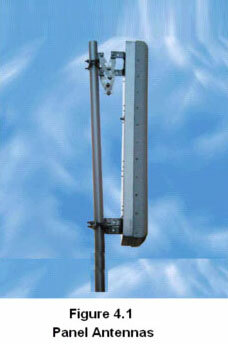 Such high gain parabolic antennas are best suited in long distance point-to-point communications. 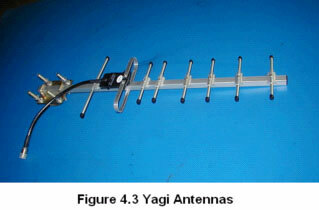 Yagi Antennas have high gain, light structure, easy installation characteristics. This type of antennas are ideal for point-to-point, point-to-multipoint communications for end users. 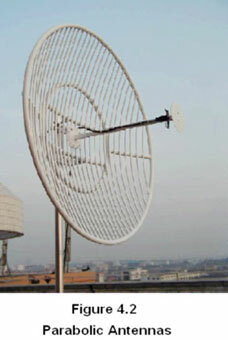 Yagi antennas are made of stainless steel or aluminum, which protected radome for heavy duty all weather outdoor usage. Ceiling mount antennas are used for in-building wireless coverage. 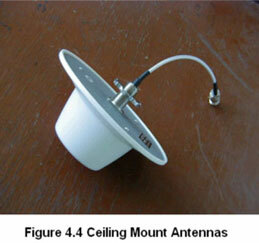 ceiling mount antennas have nice exterior design and excellent electrical performance. Customization to these low-profile antennas are welcome. Wall mount antennas are designed for indoor coverage. Ceiling mount antennas tend to cover the area in 360 degree direction while wall mount antennas tend to provide stronger signal in a particular direction. 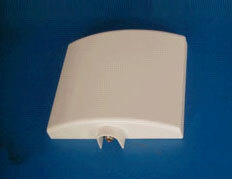 Wall mount antennas have good gain, nice texture, and easy installation characteristics.